Our philosophy at Bothy Vineyard is to produce the highest quality wines from grapes cultivated in as environmentally-friendly a way as possible. We continue an ancient tradition of wine making in the Vale of the White Horse, Oxfordshire. The local micro-climate, warm sandy soils, long ripening season and mature vines produce wines of consistent depth and quality which have won many awards. Visit us to experience the freshness and character of English wine at its best. We're taking part in the English Wine and Food festival on 8th June. Read more here. We welcome sales by appointment - please ring 01865 390067 to arrange a purchase. Your chance to purchase the last few bottles of our 2017 Oxford Dry and the award-winning Doctor's Bacchus. The 2017 Renaissance (soft, peachy and complex) is tasting fab right now. Perfect for accompanying your Christmas feasting. Introducing our new vintage Halcyon Days - be the first to try this newcomer.Perfect for Valentine's Day or Mother's Day. The fruity and soft 2016 Cote Bothy, a rare English red, is just the thing for red-wine lovers who want to avoid the high-alcohol burn. Plus lots of wine-related cards and gifts. 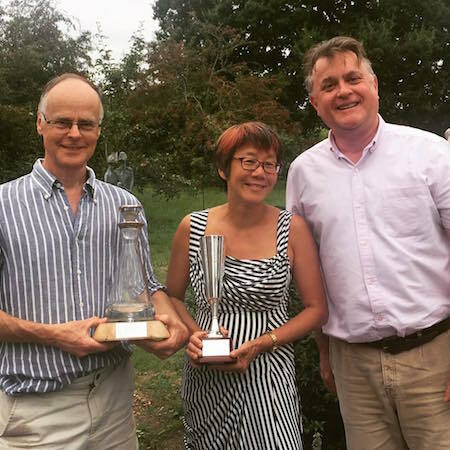 ​Bothy won Best White Wine and overall Best Wine in the regional competition with its 2017 Doctor’s Bacchus. Richard and Sian Liwicki pictured here with judge Yannick Joseph in front of Sculpture in the Vineyard 2018. The season for tours is from May through to September. Tours can be booked for groups of 12 - 30 at £10 per head. We have ample parking and there is disabled access to the winery and shop. Smaller groups may apply to join existing tours where dates have already been arranged. Tours are also available at 2pm on the last Saturday of each month - please check with us. Please ring 01865 390067 to discuss details or book or e-mail office@bothyvineyard.co.uk Visit Tours for more details. If you have visited Bothy Vineyard or tried our wines, please leave us a review on Trip Advisor. Events & News We are seeking help from Local Businesses to gather more corks for a good cause. For every natural cork recycled through Bothy Vineyard, over 1p will go towards protecting local wildlife. If you can help, then please send your corks to us or drop them off at the Marcham Shop. More info here. Oxford Dry - Oxford white wine, Oxfordshire.